It’s a rare occurrence that a deceased musical artist would be honored in his hometown on the anniversary of his death with flags flying at half-mast. This happened on Tuesday in Liverpool in honor of George Harrison, lead guitarist for The Beatles, who died of cancer on November 29, 2001. Born February 25, 1943, Harrison lived a modest life as the youngest of three in a Roman Catholic family. As a teen, Harrison was accepted into the Liverpool Institute for Boys, where he became friends with Paul McCartney. McCartney got him an audition for the band he played in with John Lennon called The Quarrymen. 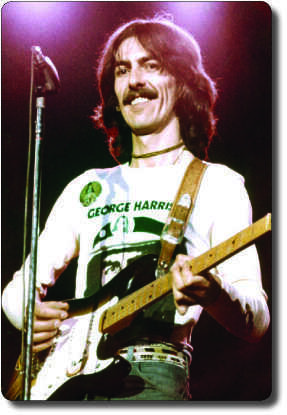 Lennon was reportedly impressed with Harrison’s performance, but said he was too young to join the group and made George a substitute guitarist. Harrison became a permanent member in 1958 at the age of 15. Although Harrison didn’t have a leading role in the Beatles, his solo career proved to be fulfilling. Rumors state John Lennon initiated the Beatles’ breakup, but it is reported Harrison left the band to focus on a solo career in January 1969. He re-joined after only a week, but the band would have their last performance later that month. Before the end of The Beatles, he recorded two solo instrumental albums titled “Wonderwall Music” and “Electronic Sound” and went on to release ten more solo studio albums. One of Harrison’s most notable contributions to the entertainment world was his humanitarian work. His close friend and mentor Ravi Shankar persuaded him in 1971 to help organize a charity concert in New York for victims in Bangladesh. The Concert for Bangladesh would go down in history as a “pioneering charity event” that raised awareness for UNICEF. George’s wife Olivia would later open the George Harrison Fund for UNICEF in honor of her late husband. This past August marked the 40th anniversary of the groundbreaking concert. After over 20 years of still being known as the quiet Beatle, Harrison published his autobiography titled “I, Me, Mine” in 1980. The book recounts his personal experiences with the band and was reprinted in 2002 with a forward by his wife. In April 2009, he was awarded a posthumous star on the Hollywood Walk of Fame. He is the second Beatle to receive a star, the first being John Lennon in 1988. The star was placed next to the headquarters of Capitol Records, which produced much of Harrison’s music.